On the second play from scrimmage in this afternoon’s Bucs-Cowboys game, Dallas defensive end Tyrone Crawford went down with a scary injury. Crawford, a defensive captain, appeared to take a shoulder to the head from his blocker as he rushed the quarterback, and he crumpled to the ground. The stadium fell silent and both teams kneeled around Crawford as he was stretchered off the field. Thankfully, Crawford was able to raise his arms as he left the field. 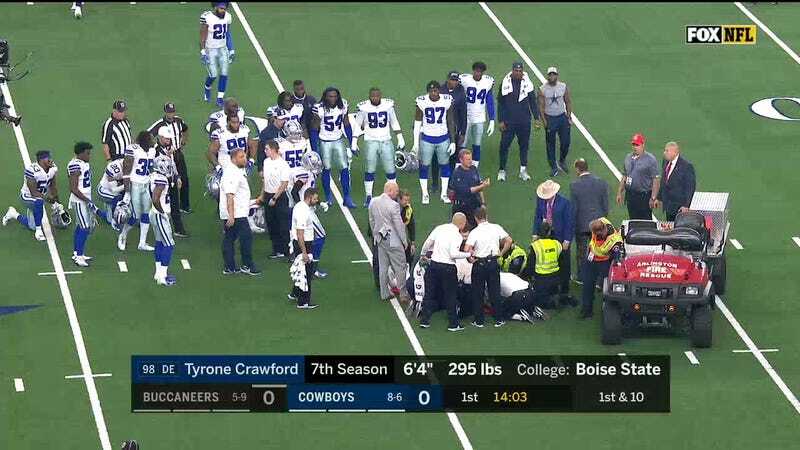 The Cowboys called Crawford’s injury a neck strain, and he’s apparently being taken to a local hospital for evaluation. We will update this post as more information becomes available.